I haven't been able to stop thinking about it. What would I do, if I were there in the concert hall and I heard the shots? I would fall to the floor. I would feel my heart beating in my chest. I would listen to the screams and wonder, for a moment, if dying would hurt. I would pray for help. I would think of the people I love and wish to see them one more time. Evil is alive in our world. We go weeks between the headlines and it's easy to forget that out there, somewhere, someone is plotting to kill and steal and destroy. We go about our lives—as we should. We worry about what we should wear and we eat our meals and step on the scale and send that e-mail... And then we are stopped in our tracks by the darkness. Every witness said the same thing. The attackers were calm. Prepared. They knew what they were doing. They shed no tears as they shed others' blood. There are countless reasons to mourn—so many that it's impossible to mourn it all. I can't put enough flag filters on my Facebook photo to cover the world with acknowledgement. Pick what outrages you. There's plenty to choose from. The murder of innocent lives. The persistence of hatred and racism. Cruelty to animals. Cruelty to each other. But as we acknowledge evil, let us not grow comfortable with label victim. Let us not be terrorized, or turn and terrorize one another with our outrage. Yesterday, as I was driving home from a meeting, I heard a story on the radio that brought tears to my eyes. A news anchor had gone looking through the streets of Paris, looking for signs of hope. Signs of life. Friday night, as he was alone baking bread, gunmen sprayed his storefront with bullets. One went in the doorway, through a refrigerated display cabinet, through a row of Coca-Colas and out the other side. Five bullets in all hit his shop. He was unscathed. He came to the aid of a woman who was shot in a car outside. Then, he said, about 15 people ran into the bakery and took refuge. A couple of hours later, President Francois Hollande declared three days of mourning and Mezian Ahmed faced a choice: Should he stay open? "I am a baker and the son of a baker," he says. "I know very well that bread, even during wartime, must always be made. Because for the people, it's a necessity. If other jobs close, it's not serious. But bread is essential. 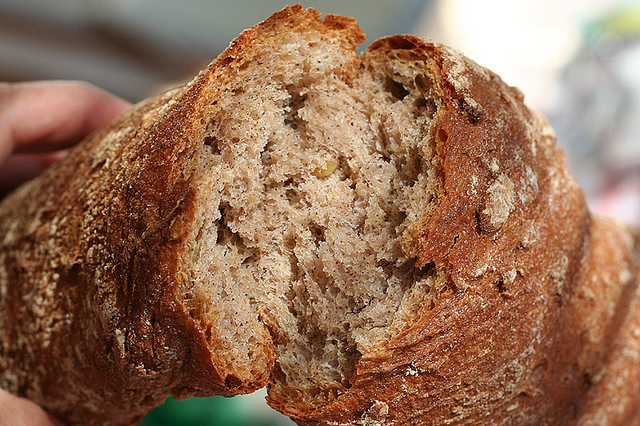 Bread is something that everyone lives with, the rich, the poor — everyone eats bread. It's a noble profession, and I'm really very proud to be a baker." So, just after this night of unspeakable terror, Mezian Ahmed went back to work. The bakery has stayed open, bullet holes and all. In Paris, life goes on. His words were a testimony to me of goodness in the face of evil. Go on baking bread. Go on providing love and comfort and sustenance to one another. Do what you were called to do. Do it well. Do it honorably. Let us not be victims. Let us be bakers.